So, dreamwidth was a fork by some LJ developers back in 2008. I do not know what I think yet. Too early. They are limited in some ways. I've had a rename token for years, and finally cashed it in. jdsdavis was not free (squatter), but joshdavis was. So, going to generic.livejournal.com, or xaminmo@livejournal.com, now goes to joshdavis.livejournal.com. In theory, all of my friends, and posts, should be here. Just a rename, not a move. "com.ibm.websphere.sca.ServiceRuntimeException: CWSXM0201E: Exception returned by mediation flow for component HSAInvestment_Mediation in module LOBSB_HSAInvestment_v2 CWSXM3713E: The fail terminal on Service Invoke primitive SI_Email in operation sendInvestmentBuyTxn in mediation component HSAInvestment_Mediation in module LOBSB_HSAInvestment_V2 was fired but the terminal is unwired: caused by: com.ibm.ws.sibx.mediation.esb.SIBXFireFailTerminalException: CWSXM3713E: The fail terminal on Service Invoke primitive SI_Email in operation sendInvestmentBuyTxn in mediation component HSAInvestment_Mediation in module LOBSB_HSAInvestment_v2 was fired but the terminal is unwired." I then checked, and I saw that it pulled the transaction twice, totaling 10/11ths of my balance. Since it was after 3pm, it was listed as a 2012-01-16 transaction. I called, and after much discussion with supervisors, etc, the phone rep indicated that we would have to wait until it settled, then I could issue a sell transaction. So anyway, I went to look, thinking I would pull the other half back, and LO! It never showed up. I have the one chunk there, and no other pending transactions. The other chunk just disappeared entirely. I should have known it was something bad, considering the websphere error mentioned FAILING TO SEND AN EMAIL!!!! WHAT?!?! Transfers should not be e-fracking-mails. Anyway, I called back in today, explained, gave the ref number, and it's being escalated to a supervisor with 3-5 day turnaround time. Not only is my short term memory horrible, but so is my short-term memory. Google plus is now on my ban list. The ipad app changed itself to automatically upload my photos during the last update. This is theft of data. Luckily I noticed on my ipad (nothing important) rather than my iphone (lots of stuff). I'm trying to decide whether this is big enough to go through the effort to fully divest myself of Google. 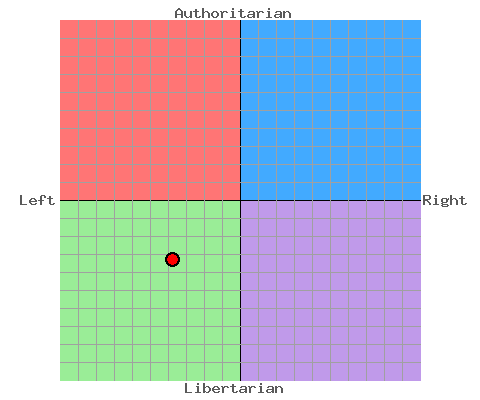 The scale is -10 to +10, and I'm I'm economically -3.75 (left vs right), and socially 3.28 (liberal vs authoritarian). Wondering about fitting into various airplanes, and how "seat pitch" plays in. Seat Pitch on a plane measures between the same places in seats, so back to back, not "the free space between seats." On the back part of an AA MD80, the seat pitch is 31", and the seat is just about 5" thick. In other words, I'm mashing myself into those seats. BEFORE YOU LEAN BACK IN YOUR CHAIR, AND THEN SLAM INTO IT WHEN IT STOPS MOVING EARLY, CHECK TO SEE IF YOU ARE INJURING THE PERSON BEHIND YOU! YOU ARE NOT ENTITLED TO INJURE SOMEONE JUST BECAUSE YOUR SEAT HAS A RECLINE OPTION!!! But really, I was measuring this to see what sorts of GA planes I could fit into. Leg Room: My upper leg needs 27" to clear the panel or seat in front of me. Seat Pitch: 27" plus the thickness of the seat. Seat Width: 19" if my pockets are empty. Headroom: My torso needs 39" from the seat to the top of the cabin. Obviously, some angles can be factored in here, but if my lower legs have to bend back, then it limits my ability to operate the rudder. Down to 244.8 LBS from 293LBS on Sept 29, 2011, or 320LBS at my peak. Counting calories, baby. I haven't given up, but I'm fighting myself substantially. I've been stuck at 250 pounds for a couple of months. I'm failing to follow the plan. * Glide brand floss, EVERY NIGHT BEFORE BRUSHING - Helps gum sensitivity. * Manual toothbrush - Sonic didn't help gums. * Arm and Hammer Toothpaste - Average 1mm gum line improvement at every tooth. * Ignore any whitening claims - None of them work. * My teeth are slightly translucent, and slightly yellow. * I tried home trays, strips, whitening toothpaste and whitening mouthwash. * None of these had any measurable change in my enamel color. * A year of use, and I had a piece chip off near a fissure. * Switching back to manual coincided with 1mm improvement + shorter pro cleaning. * Gum sensitivity, bleeding and redness all went away after a year of daily flossing. * Flossing only 50% of the time is no different than only flossing for popcorn. * Flossing 99% of the time makes a big difference. * Most have too much saccharine, which tastes sweet and odd in the morning. * Rembrandt toothpaste left a lot of plaque, tartar, etc for the hygienist. * Crest didn't feel clean after. * Crest left an odd, sweet flavor in the morning. * Arm & Hammer feels clean and scrubby. * Arm & Hammer coincides with 1mm improved gum line. * Arm & Hammer improvement even after missing 20% of morning brushes for the month leading up to cleaning. I only need one, and I wanted it to pretty closely match what's already in the car. If I needed 2, I'd have been hard pressed not to get the black matching set, and I'd probably have gotten the matching belts for the back seat too. This sums up my brain... You know, except for the 20point IQ spread, but whatever... Hey, I'm lazy and older. I'm probably less intelligent now anyway, right? I love when I go to look for something on the web, and I find a perfect, clear answer.... and then I see the author is me. Various issues I've run into and resolved. Cut/paste out of a doc I'm working on, so the formattng isn't HTML/LJ pretty. * 320G Laptop drive DOES work - it's my carrier's power bus wearing out. No one really cares. This is more for me. "At a very early age you will learn that life requires hard work and ceaseless activity if you want to get ahead. You respect those in authority even when you feel they are giving you a hard time. Only if you have very negative experiences with authority while you are young you will be negative about it when you are older. No matter what career you choose, you will be a teacher and a guide for others. As you work to get ahead in life, however, be very careful not to neglect your friendships and other relationships. Unless you foster them, you could be very lonely later on in life."